I have talked before about my Mom being a simple cook but a wonderful baker. But whether my Mom was cooking simple dinners or her famous banana bread or pies she was always making the same things. I guess she felt so comfortable with her tried and true recipes that she never strayed! One meal though that was always special was Sunday night dinner. That is when my Mom took a little extra time to make dinner and have everything from dinner rolls, side salad, to dessert! Sunday dinner was the one night when dinner wasn’t rushed or quickly eaten to run out the door to a choir concert, or girl scouts, or soccer practice. It truly was a special time! Of course as a child (heck even as an adult) I always looked forward to the dessert at Sunday dinner! ; ) And even though my Mom was *known* for her moist banana bread, chunky chocolate chip cookies, and pies that could send Paula Deen running, Sunday desserts were much simpler. Strawberry pie using store bought strawberry glaze, boxed brownies with Blue Bell ice cream on top, or strawberry shortcake! 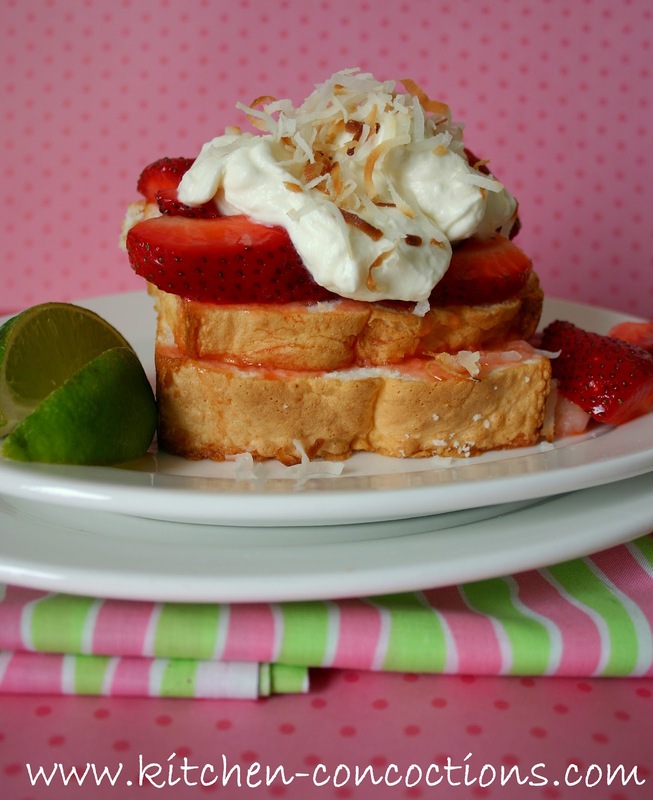 Strawberry shortcake is such a humble dessert with three main ingredients, strawberries, pound cake, and whip cream! However, I love this kicked up tropical version (seriously, Eric and I were licking our plates)! Even with a few extra ingredients this recipe is still uber simple. I choose to use store bought angel food cake but feel free to make your own. I did make my own whip cream (as written in the recipe below), which is really quite easy, but if you are crunched for time you could use thawed frozen whipped topping and just stir in the vanilla and coconut extracts to and the extra umph! But however you choose to throw this dessert together just make it! It would make for a lovely (and easy peasy) Easter dessert or dessert for any family dinner large or small! Mix sliced strawberries, sugar, lime juice and zest. Stir well and set aside. Stir occasionally over about 15 minutes. You want the sugar to dissolve and form a light syrup. For the cream, place whipping cream in a bowl and beat with an electric mixer for about one minute. Slowly add in powdered sugar, and both extracts. Continue beating until soft peaks form. 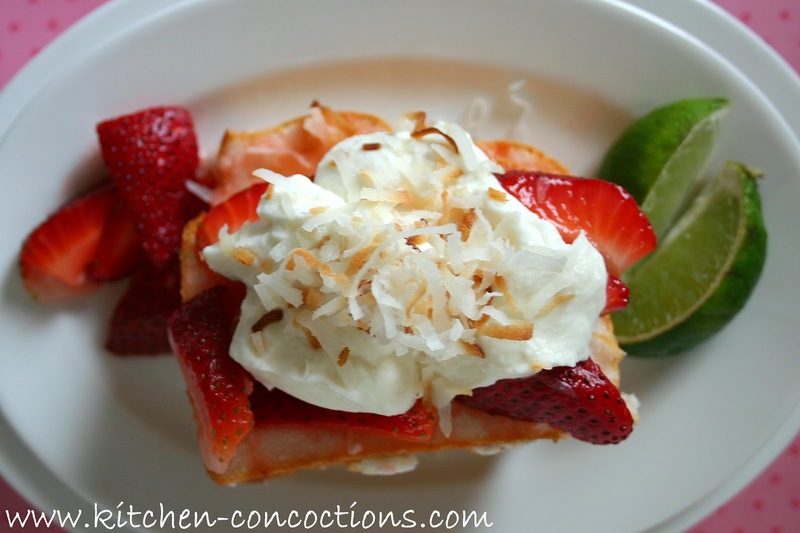 Slice cake and spoon a layer of strawberries on top, including some of the syrup! 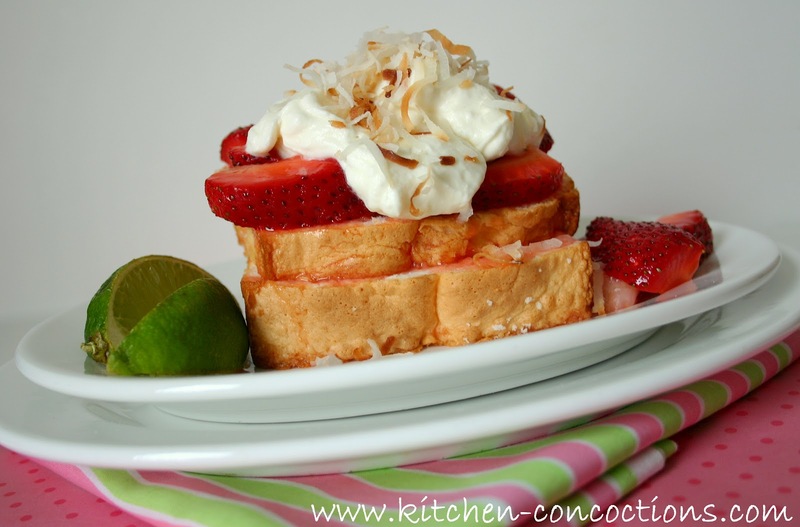 Top with a generous dollop of whipped cream and sprinkle with coconut. *Toasted coconut: Preheat the oven to 375F. Spread the desired amount of sweetened coconut on a cookie sheet or other oven-safe dish. Place in the oven and cook for about 2-5 minutes, depending on how much you are doing. Stir often, about every 30 seconds, to avoid burning. The coconut will be dry and lightly browned when done.